Apparently I need a “wedding miniseries” button to tag these posts… What follows is a complete transcript of our wedding ceremony. In the interest of full disclosure, I must admit that little to none of this is original content. 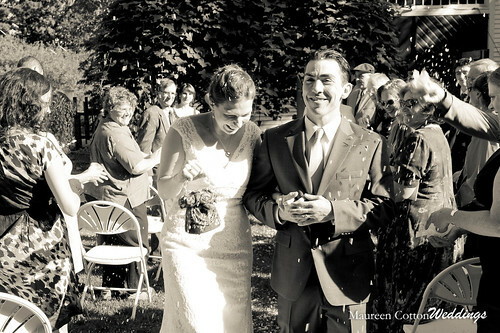 Many, many heartfelt thanks to the good folks in blogland for sharing their own vows, and in particular the contributors to this post on A Practical Wedding. I figured I’d give back to the ‘net by sharing mine and hopefully help some other poor bride trying to scrape together a ceremony a week and a half before D-day. Not that I have any experience in that. Future brides, please feel free to steal wholesale. 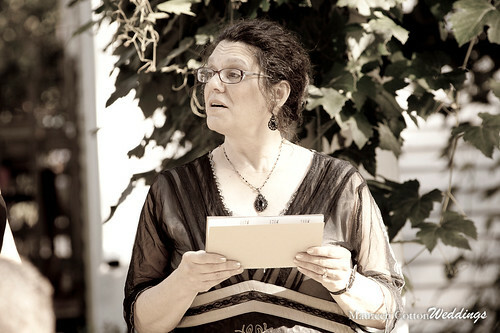 OFFICIANT: Welcome everyone. The ceremony is about to begin, so please be seated. We ask at this time that you please turn off all cell phones and electronic devices. Groom takes his place next to officiant. Groom’s parents walk down the center aisle and take their seats. Bride’s parents walk down the center aisle and take their seats. Best Man and Maid of Honor walk in and stand on the either side of officiant. Groom walks to barn door, music starts (“Ni ar cnoc ná ar isleacht” on Irish bagpipes) as groom opens the door and bride walks out. 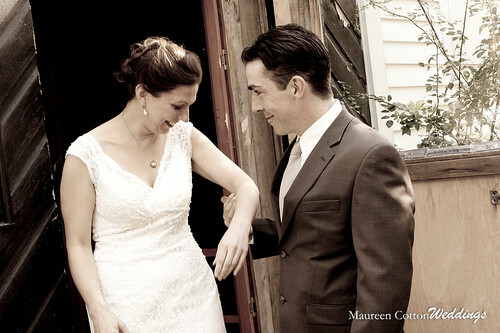 Bride and groom walk in together, then go stand in front of officiant. Marriage requires a commitment to care for another person, to show concern for the life and growth of those whom we love. Marriage requires a commitment to respond to another person, to help meet their needs. Marriage requires a commitment to respect the unique individuality of that person, to help them grow and unfold for their own sake. Marriage requires a commitment to transcend our own egos, to use reason and humility to understand another person; and by doing this, we discover ourselves. All these commitments require that we give ourselves to another person; by this giving, we experience our own strength and our own vitality. We experience ourselves as overflowing and alive. Today we affirm and celebrate this commitment being made between Mr. Manly and The Hungry Crafter. Bride’s mother approaches and stands to the side of the wedding party for the reading. “I salute you. I am your friend, and my love for you goes deep. There is nothing I can give you that you have not. But there is much, very much, that, while I cannot give it, you can take. Life is so generous a giver. But we, judging its gifts by their covering, cast them away as ugly or heavy or hard. Remove the covering, and you will find beneath it a living splendor, woven of love by wisdom, with power. Welcome it, grasp it, and you touch the angel’s hand that brings it to you. Everything we call a trial, a sorrow or a duty, believe me, that angel’s hand is there. The gift is there and the wonder of an overshadowing presence. Your joys, too, be not content with them as joys. They, too, conceal diviner gifts. 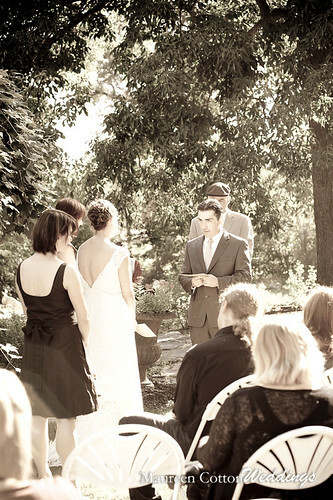 OFFICIANT: At this time, will the parents and siblings of the bride and groom please stand? 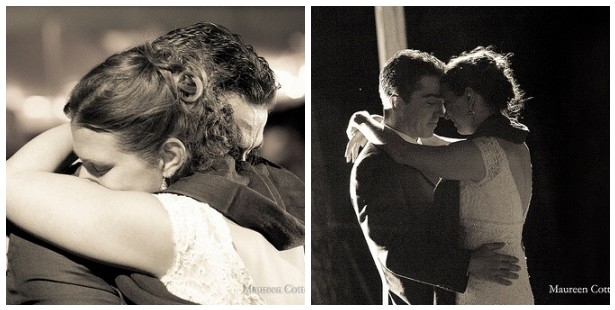 BRIDE AND GROOM: We do. OFFICIANT: At this time, Mr. Manly and The Hungry Crafter would like to read a few words to each other. 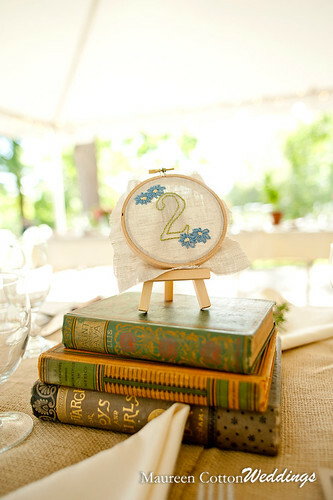 GROOM: Hungry Crafter, I believe that the key to a successful relationship is a kind of selflessness. Not the unhealthy stifling of one personality in favor of another, but the fusion of two individuals into a new union far beyond the achievements of simple addition. I do not vow to create this union today. It’s not possible to create something that has existed for so many years already. I vow instead to sustain our union, fighting for it when the need arises, and all the while developing it far beyond what was initially thought possible. To this end, I promise to forever be your anchor when you are lost in the storm—holding you steady—until we can find our way home. Should you feel weak, I will be your strength. At all times you will know my mind because you are always in my thoughts. You are my best friend, my shelter in hard times, the voice of reason in the middle of the night and, starting today, my wife. You are the better angel of my nature. Throughout history there have been many great men with accomplishments both good and far-reaching. Though I’ve often envied and admired them, I’ve come to realize that I would count myself as their equal, or even their better, if my only achievement in this life was to make you happy. I love you more than you will ever know. BRIDE: Mr. Manly, you know I don’t believe in soul mates. I never have, and probably never will. Instead I believe in making choices, and continuously dedicating yourself to those choices. Today I choose you. I choose you to be my partner, my husband, and my family. I chose you yesterday, I choose you today, and will continue to choose you every day. I make this choice, because I love what I know of you, and have the faith to trust what I don’t yet know. I know you fill my heart with hope and joy. You make me laugh, laugh with me (and…at me! ), you encourage my dreams and you help me grow. You offer me a kindness and security that I didn’t know existed. Your confidence in me is humbling. For these, and a hundred other reasons—I love you. Today, surrounded by our friends and family, I take you for my husband. I promise to stand by you, encourage you, dream, laugh and cry with you. I promise to love you not only when it is easy, but also when it is difficult. I vow to remember that we are two different people who deal with problems in different ways. I vow to respect you and your opinions and ideas. I promise to remember that we are a team, and that we are always in it together, and that we are stronger together than we are apart. I promise to try every day to be a wife who is worthy of your love. And finally, I promise that you will always be my family. You are part of who I am, and that can’t ever be undone. I love you more than you will ever know. OFFICIANT: Mr. Manly & The Hungry Crafter, please hold hands. Mr. Manly’s mother will now join us for the blessing of hands. Officiant steps to the side, mother of the groom comes up and stands where officiant was standing. These are the hands of your best friend, young and strong and full of life, that are holding yours on your wedding day as you promise to love each other today, tomorrow and forever. These are the hands that will passionately love you, and with the slightest touch will comfort you like no others can. These are the hands that will hold you tight when you encounter fear or grief. These are the hands that will give you support and encouragement to go after your dreams. These are the hands that will give you strength when you struggle through difficult times. 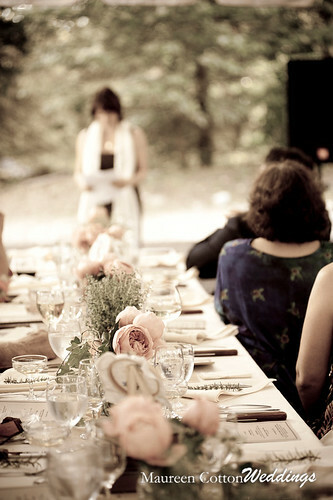 Takes her seat; officiant returns to her place. 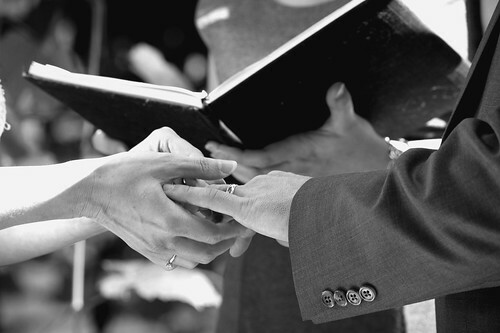 OFFICIANT: Who presents the rings? Friend brings ring pillow up to officiant. 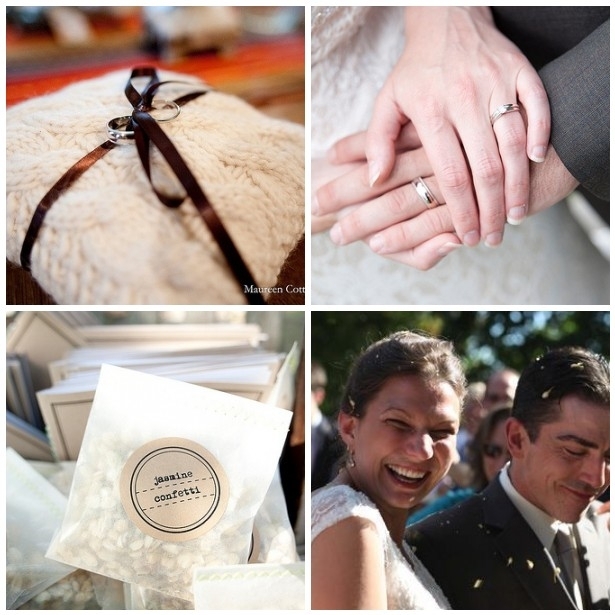 While friend holds pillow, officiant unlaces and removes the rings; friend takes empty pillow back to her seat. 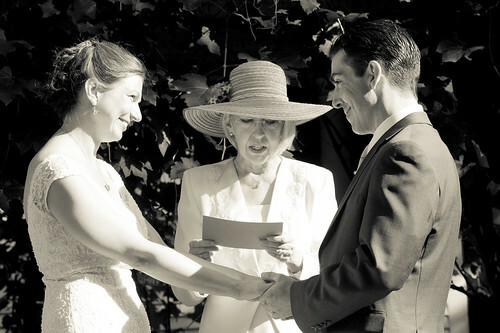 Officiant hands bride’s ring to groom, keeping groom’s ring in her hand. and as a constant reminder that you are dearly loved. OFFICIANT: May all who love The Hungry Crafter & Mr. Manly continue to rejoice in the commitments they have made to one another. May their home be a place of peace for them and all who enter into it. Inasmuch as The Hungry Crafter and Mr. Manly have consented together in this ceremony to live in marriage and have witnessed their vows in the presence of this company and have given and received rings as a token of their vows, I now pronouce, by the authority vested in me, and in accordance with the laws of the Commonwealth of Massachusetts, that The Hungry Crafter and Mr. Manly are husband and wife. Mr. Manly, you may now kiss the bride. Officiant cues bagpiper to start playing; joyous recessional music begins, bride & groom exit through center aisle – yay confetti toss! 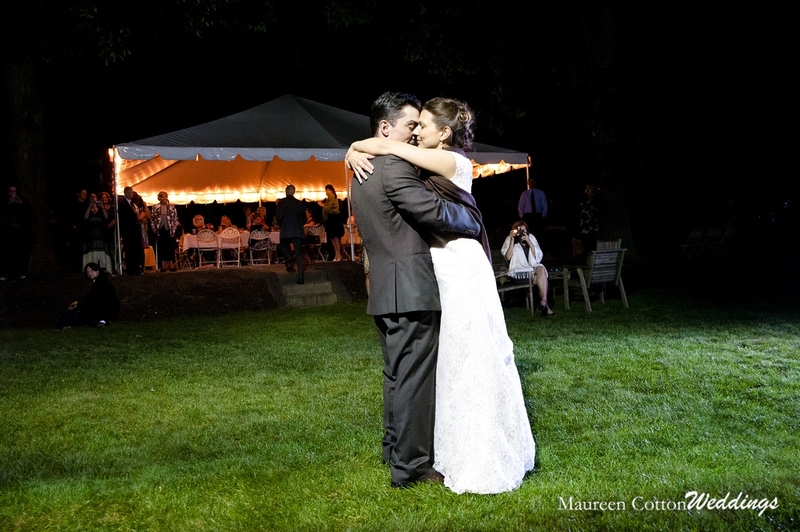 I must confess that I barely remember a word the officiant said because I couldn’t take my eyes off Mr. M. I’m not sure I was aware that anyone was there but the two of us. 3. my camera. As in, my nice camera. My Canon Rebel XT. The one I use to take pictures of food for this blog. 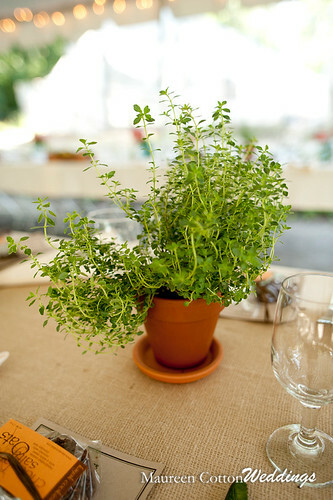 The one with the pictures of the Austin to Boston food swap still on the memory card. Sigh. I spent all day Saturday reorganizing and scouring the basement in search of said camera, to no avail. It will turn up. It HAS to. All of which is to say, with no new photos for you, I thought this was a good time to give my wedding its due here on the old blog! 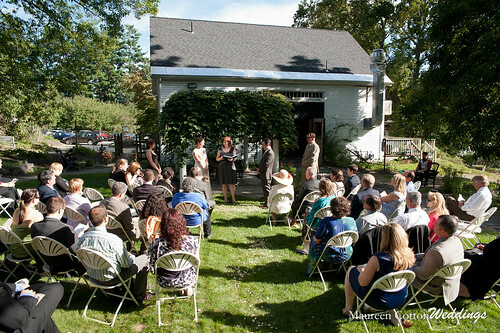 Mr. M and I were married at 4pm on 9.10.11 at The Herb Lyceum in Groton, MA. Our previous “dating anniversary” was 9.11.04, so I liked the idea of keeping it close to that date, while changing it to something more socially acceptable for celebration. I also knew I wanted to get married in September, as it’s the least risky month for weather here in New England — if such a thing truly exists. 1). Good food. This is a big surprise to you all, I know. 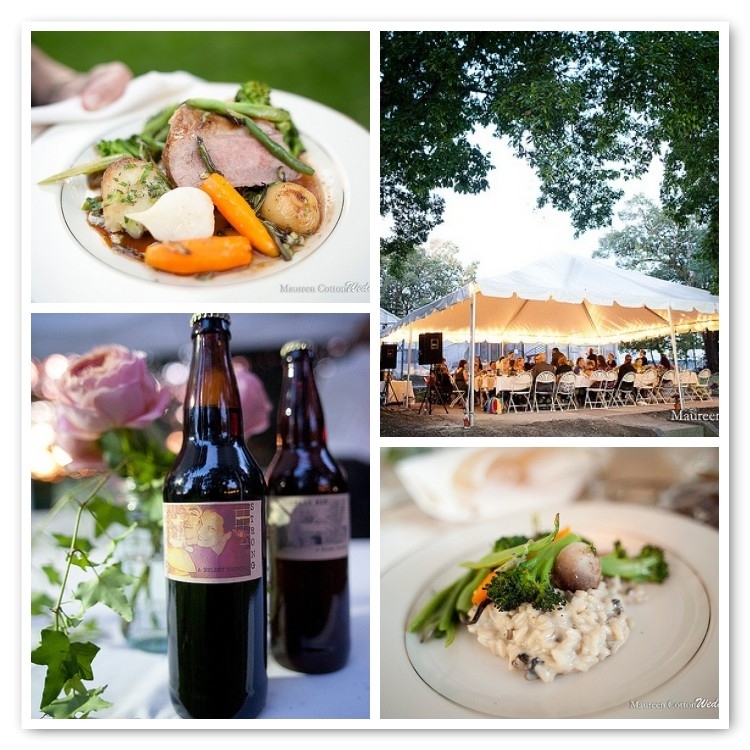 I simply couldn’t bear the thought of mediocre catering, and this priority was instrumental in our choice to get married at the Herb Lyceum. Having eaten there on two previous occasions, I knew the food was spectacular, and would incorporate fresh herbs and seasonal, local ingredients. The icing on the wedding cake? 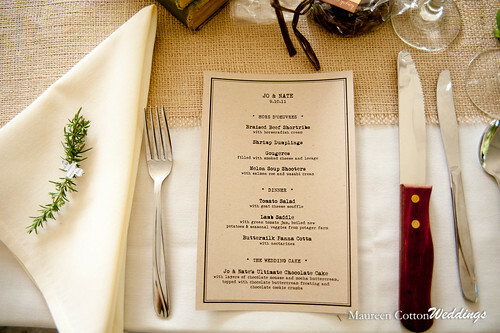 No set catering menu — we got to work with the chef to customize the meal 100%. In addition to the quality of the food itself, I was equally concerned with the quality of the dining experience. I know, I know…I’m a little obsessed. 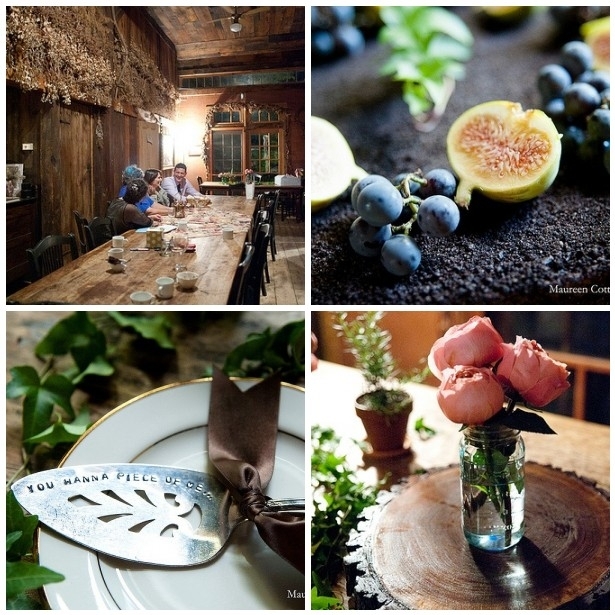 I can’t help it; I just adore a good meal, including all the intangibles that bring it together: the ambiance, the pace, the company, the conversations… The goal was a European-style sit-down meal with multiple courses that lingers into the evening and encourages relaxed conversation. (To that end, the seating chart was well thought out. What’s the point of being a Type A personality if you can’t enjoy seating charts and Excel spreadsheets?) Last but not least, the dessert course would not be an afterthought. The cake. would. rule. 2). Supporting local. This phrase can mean many things to many people; for us, it meant being thoughtful about where our money was spent, giving preference to local vendors and ingredients, and selecting small, independent businesses whenever we could. We placed high value on vendors whose skills we admired and wanted to support, and chose people we enjoyed working with and wanted to support. We used Etsy a lot. This translated further into supporting handmade in general, be it by talented artisans, talented friends, or, well, li’l ole me. 3). Not breaking the bank. I don’t think it’s news to anyone that weddings can be ridiculously expensive. It simply is not in either my or Mr. M’s value system to spend outrageous amounts of money on, well, much of anything. (Fabric doesn’t count. Ahem.) 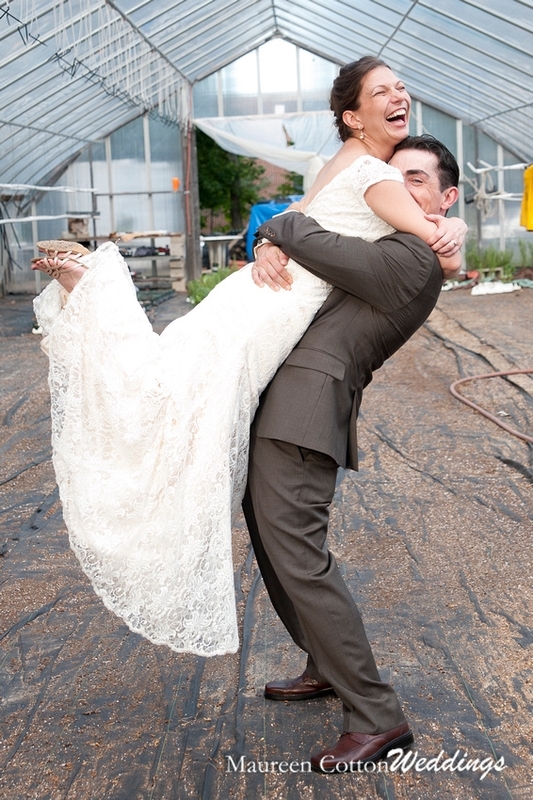 On the other hand, we were getting MARRIED!!! We had officially found the love(s) of our life! This was a BIG DEAL! I wanted to give ourselves enough rope to have a celebration befitting the enormity of this milestone, without putting a damper on the yelling-from-the-rooftops joy I felt. So we settled on a budget that was certainly below the average cost of a wedding in the US, but still large enough to allow us to splurge on the things we valued most. We splurged on food. We splurged on our photographer, bagpiper, and stationer. In exchange, I got my dress on eBay for a small fraction of the price some folks pay. I did my own makeup. 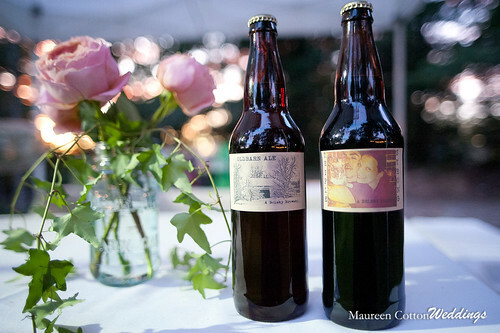 We bypassed many of the traditional elements that weren’t meaningful to us, such as engagement shoots/parties/announcements; dancing (and consequently DJs and floor rentals); boutennieres, garter and veil; and videography. We kept the guest list as small as possible, in keeping not only with our budget, but the intimate, familial vibe we hoped for. We did our own flowers. Our rings are simple, but classic. We used an iPod for the bulk of the music. The bar, while open, was limited to homebrew, wine, vodka and gin. Non, je ne regrette rien. 1). Chocolate. I mean really. Does this need any explanation? Why WOULDN’T you have a chocolate wedding? It started with the food. Doesn’t it always? Mr. M and I are both chocolate fanatics who, our whole lives, have always insisted on chocolate cake with chocolate frosting for our birthdays. So it was decided early on that the cake (yes, THE cake. The one that rules, remember?) would be all chocolate, with two layers of mocha frosting and a center layer of chocolate mousse…all covered with chocolate buttercream and finished with a chocolate cookie crumb coating. 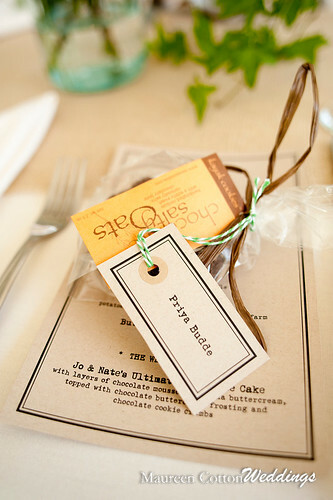 The favors were the ever-fabulous Chocolate Salty Oats cookies from Kayak Cookies on Cape Cod. 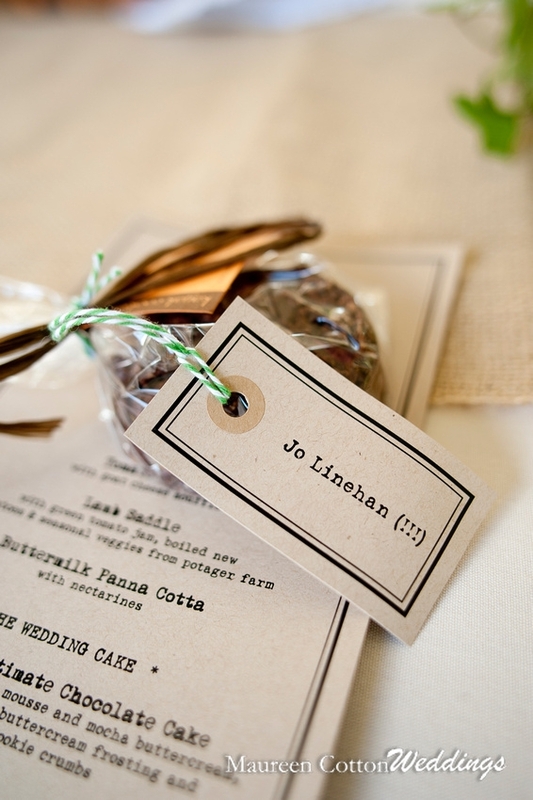 From there, it was only logical to go with my natural affinity towards the color brown, and make chocolate brown one of the main wedding colors. The color extended to the wedding party, my pashmina and handbag, and invitation envelopes. Parallel to this theme was a light brown/naturals color scheme. 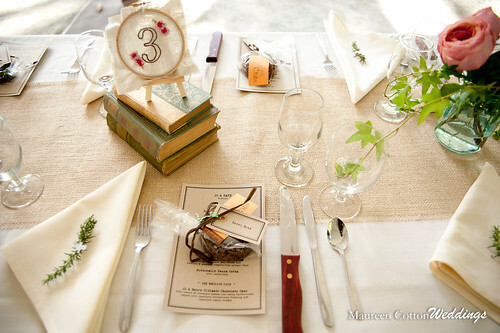 The mens’ suits were subdued shades of brown, the paper goods were all printed on kraft cardstock, while burlap and twine (both cotton and jute) were used throughout. And in a nice local touch, the kind folks over at Taza Chocolate donated one of their burlap cacoa sacks to me to be used as a table runner for the photo booth table. 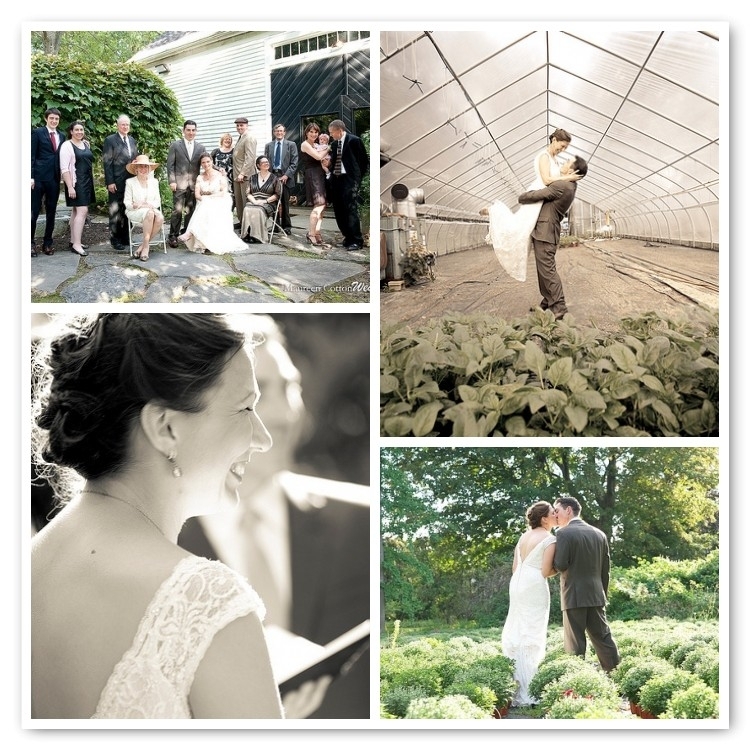 Our photographer also snagged some gorgeous photos of us in the lavender garden, in the greenhouse behind several flats of basil, and in a growing field of potted herbs. Ivy encircled and adorned the cake. 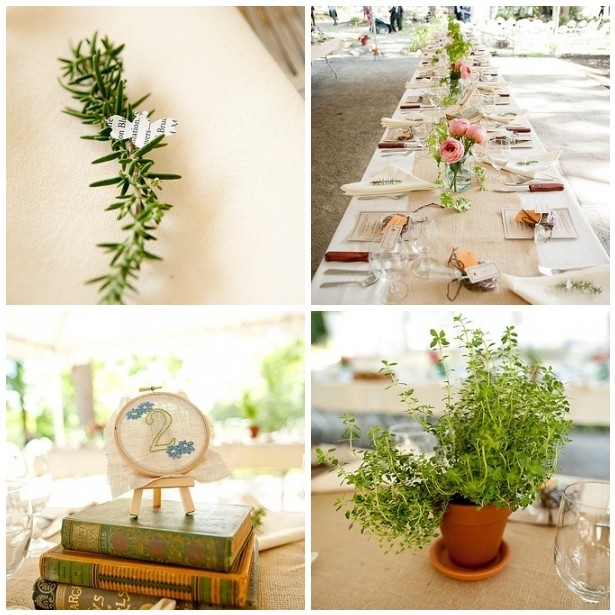 Out of this theme, green naturally became a secondary color, further incorporated through the use of green bakers twine and moss. I found a particular print that I loved and used that as my main inspiration piece for both color scheme and design. I purchased a small swatch from Etsy, due in part to the aforementioned cost, but primarily due to the fact that this particular print was only produced for a limited time in Japan, and honestly CANNOT BE FOUND anywhere. Trust me, I tried. And I’m good at that sort of thing. The 8″x8″ square I bought may be the last piece in existence. With the precious swatch in my possession, I scanned it into my computer and printed copies out onto a thick glossy paper, and used the printouts to make custom envelope liners for the invitations. I then used the same scan to add color to the enclosed accommodations card and the address labels for the RSVP envelopes. Next, I enlarged the print and outlined several of the motifs to incorporate the designs into the hand-embroidered table numbers. With that done, I finally used the fabric itself as the underside of the ring pillow I sewed (the top side being knit by my Mom). While the bulk of my colors remained muted (chocolate, herbal green and pink), I indulged my playful side at the photobooth where I covered ~60 clothespins with a variety of bright Liberty fabrics. A great way to stretch that fabric, for sure! 4). “DIY-Faux vintage.” This is the loose term I coined to capture the style of the day. 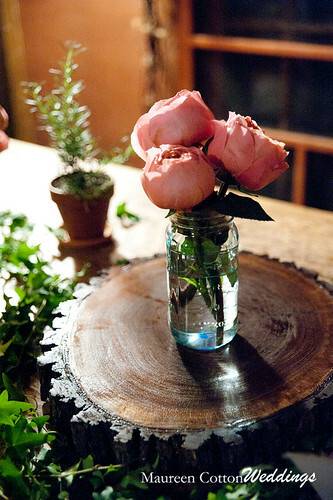 As an outdoor, artsy DIY wedding, it’s easy to fall into a very rustic, camp-style feel. 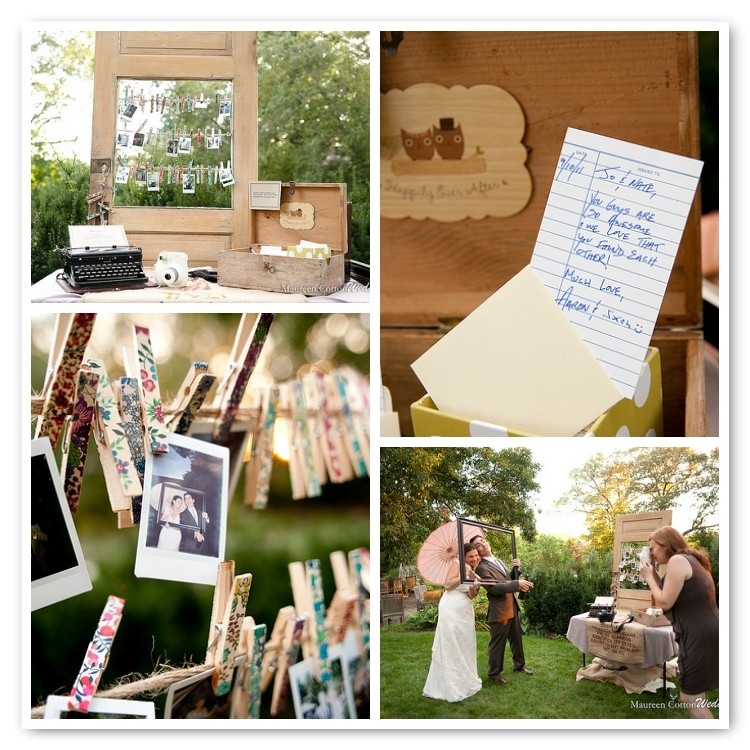 A fun and well-loved theme, for sure, but I wanted my outdoor artsy wedding to fall more on the elegant side than the whimsical side (due in no small part to Mr. M’s wariness of all things “hipster.” How I managed to get the photobooth past him is still a mystery to me). 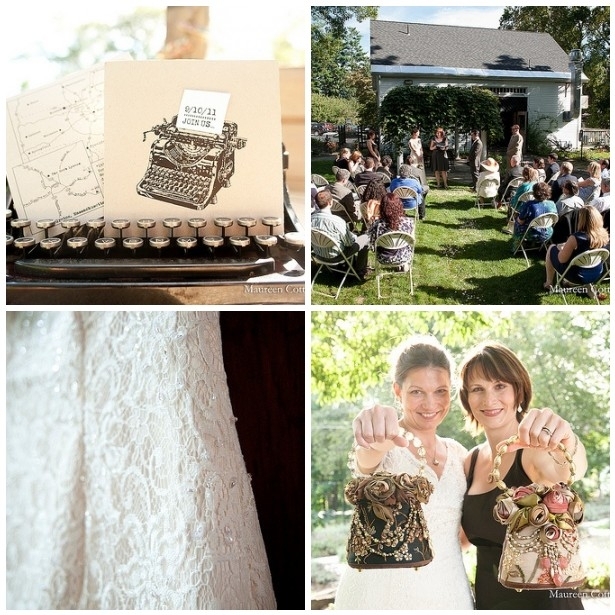 So, with the desire for elegance, the love of the vintage Liberty designs, and an awesome stationary design from Papier Lapin featuring an old vintage typewriter, I began trolling the wedding boards for more old-timey inspiration. Add in a lace wedding dress, jewelry from La Vie Parisienne, faux vintage glass vases, antique books and hand embroidery, and you have yourself a theme, ladies and gents. Armed with these principles, themes, and a 21-tabbed Excel workbook, somewhere, somehow, we did in fact pull off the wedding of our dreams. 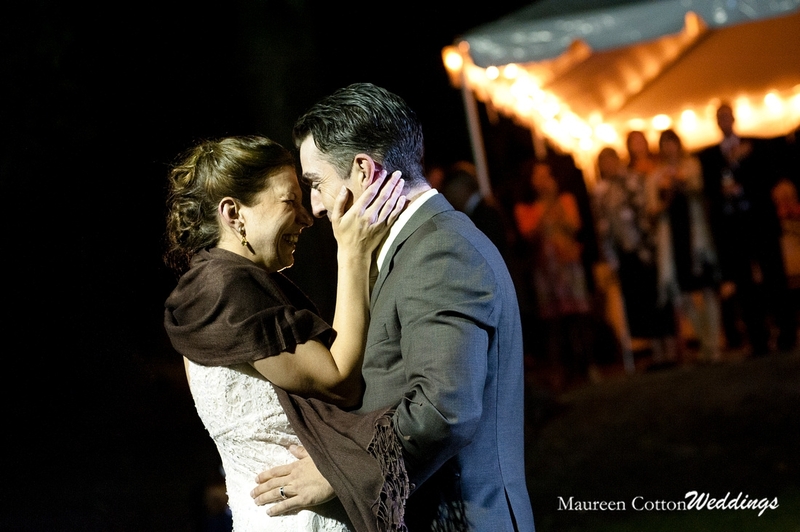 Our wonderful wedding photographer, Maureen Cotton, put together the following slideshow for us, which seemed a fitting way to close. 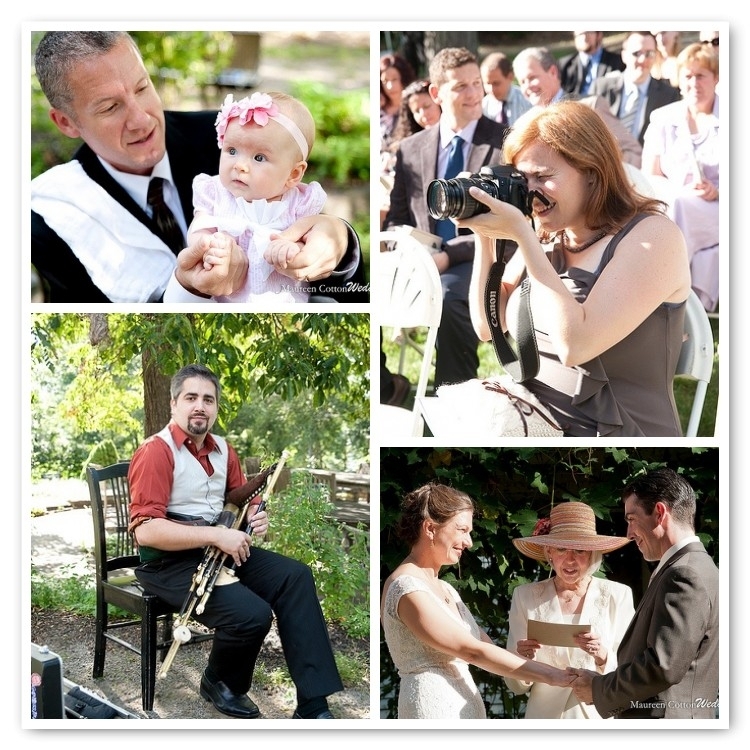 Listen closely — the music is by none other than Dan Meyers, the bagpiper who played at our ceremony! 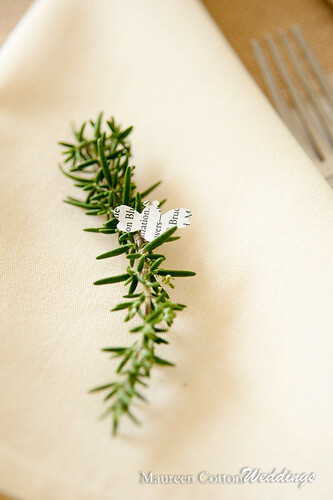 I’ve got a few more wedding posts up my sleeve to keep us occupied until the camera turns up…details on the ceremony, the music and some DIY projects. 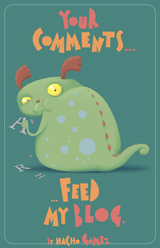 If there’s anything in particular you want to hear about, leave a comment and let me know! 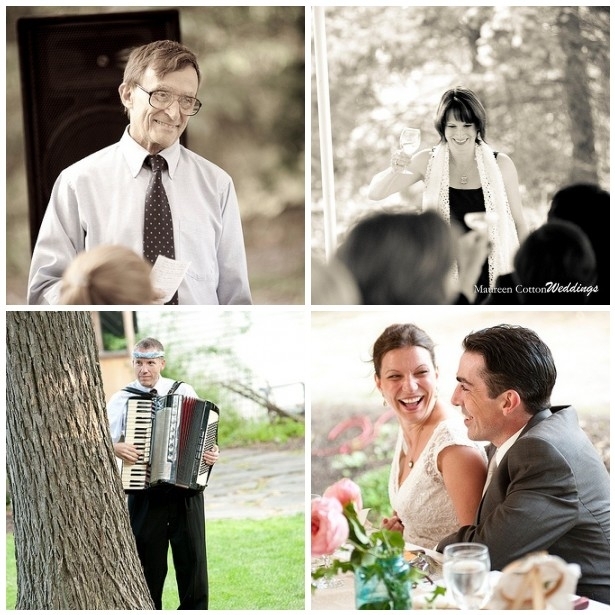 How does one go about writing a single post encapsulating their wedding? Having come off a good nine months of obsessively reading several wedding blogs on a daily basis, you’d think I might have figured this out by now. 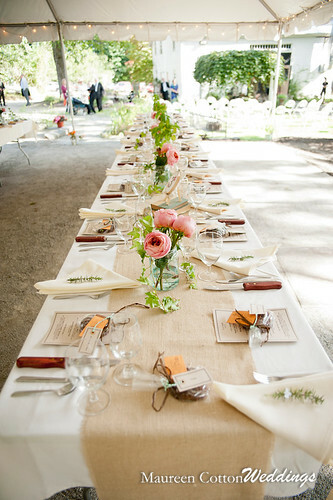 Some newlyweds write wedding graduate posts full of reflection and self-awareness; some are artfully set up as inspiration board theme parties (think A New England herbal barn wedding or J&N’s local-infused DIY faux-vintage chocolate extravaganza…); yet others simply show photos and let the images speak for themselves. Myself? I’ve been stuck. It’s not like I haven’t been thinking about it. I did just spend the bulk of a year virtually singly-focused on preparing for this day. As you might expect, I have plenty of thoughts on the matter. But how to approach? Do I offer words of wisdom for future brides-to-be? Think in retrospect about which things were wise decisions, and which things I would do differently? Wax philosophical about the virtual barrage of life lessons that were hurled at me along the way? I’ve always admired the many women who write from the heart about their joys and struggles, hard-won victories and humbling blessings, their moments of grace and of shame. I’ve been hesitant to do so myself, however, because I don’t want to dispel any of the magic that is still settling down around the corners of today, this beautiful afterglow of our wedding. To be sure, I encountered plenty of both good and bad along the way — to say it was an emotional year is a bit of an understatement — but I am so grateful and relieved to be able to say that it was all worth it. Every last cent and each minute spent, every long night of insomnia, fighting back stress and the hounds of indecision… It all culminated in a day that will live in my mind and heart forever, the culmination of a year after which I’ll never be the same. How do I write that all in a single post? All photos by Maureen Cotton Weddings, except as noted. 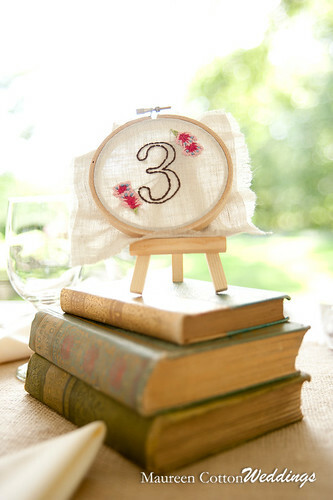 …with a new name and a whole slew of DIY wedding crafts to post about. And just maybe some delicious food as well. 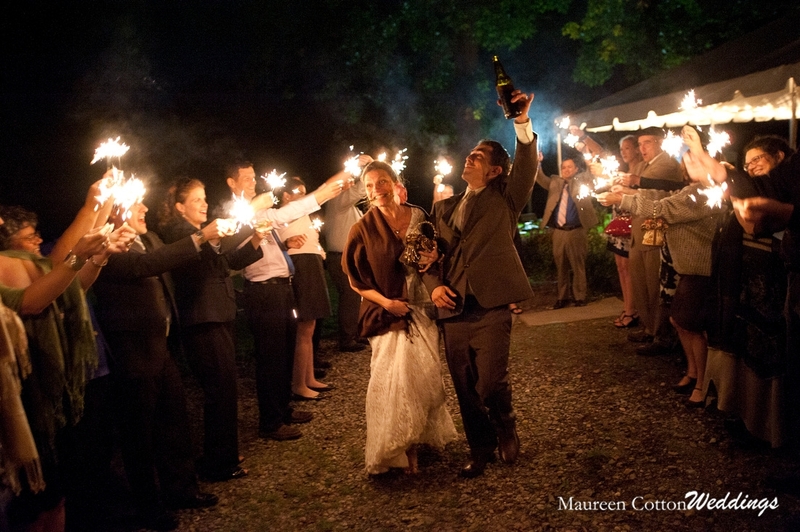 I’m happy to report that our wedding was the event of the century, and all went off without a hitch.